Wardley Premium Spirulina Discs are an all vegetable food for bottom feeders and algae eaters. Formulated with spirulina as its chief ingredient, this blue green algae is known for its abundance of color enhancers. Premium Spirulina Discs has different options and/or variations, please choose below. 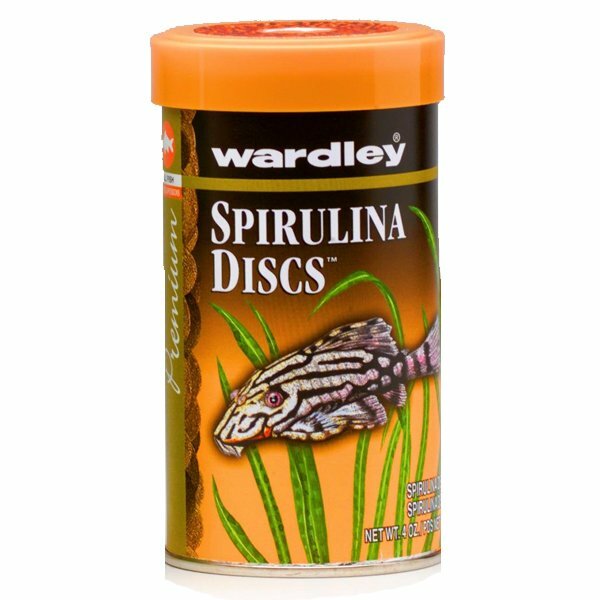 Wardley Premium Spirulina Discs are an all vegetable food for bottom feeders and algae eaters. Formulated with spirulina as its chief ingredient, this blue green algae is known for its abundance of color enhancers. With the addition of stabilized Vitamin C and a multivitamin supplement, this food is a perfect diet for herbivorous fish. Feed once per day, remove all uneaten food after 12 hours. Will not cloud water when fed properly. Spirulina Algae Meal, Corn Gluten Feed, Corn Gluten Meal, Corn Distillers Dried Grains, Wheat Flour, Wheat Germ, Wheat Gluten, Wheat Middlings, Linseed Meal, Canola Meal, Dehulled Soybean Meal, Soy Protein Concentrate, Pea Protein, Brewers Dried Yeast, Corn Flour, Rice Flour, Dehydrated Alfalfa Meal, Soy Protein Isolate, Ground Barley, Calcium Carbonate, Soybean Oil, Spinach Powder, Dried Lecithin, L-Ascorbyl-2-Polyphosphate (Source of Vitamin C), Dicalcium Phosphate, Choline Chloride, Vitamin A Acetate, d-alpha Tocopherol Acetate, Cholecalciferol (Source of Vitamin D3), Calcium Pantothenate, Biotin, Pyridoxine Hydrochloride, Ethoxyquin (a Preservative), Thiamine Mononitrate, Folic Acid, Riboflavin, Cyanocobalamin (Source of Vitamin B12), Manganous Oxide, Zinc Oxide, Ferrous Carbonate, Copper Sulfate, Zinc Sulfate, Calcium Iodate, Cobalt Carbonate, Sodium Selenite. Are an all vegetable food for bottom feeders and algae eaters. Formulated with spirulina as its main ingredient, this blue green algae is known for its abundance of color enhancers.